Think Dwarf Fortress but sci-fi. And not ascii. That thing I mentioned a couple of months ago has come to pass. 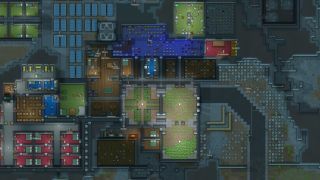 No, I hadn't predicted Brexit or Pokemon GO, unfortunately; I mentioned that Ludeon Studios' ambitious, complex colony sim RimWorld was heading to Steam Early Access, along with a new update that would add a scenario system to the game. Well, it happened. It happened yesterday, in fact. And the game has already garnered "overwhelmingly positive" reviews. If you bought it previously from the official site, don't worry: you're getting a Steam key. Just click on this link, enter your details, and you'll get one. Ludeon would still prefer you bought the game from their site, however, as it means they'll get "significantly more of the money" from the sale, as Steam won't be hoovering up their usual cut. Either way, you'll get a Steam key.